Top Innovation Keynote Speaker. Ignite your creativity, innovation, energy, and ROI with secrets from jazz. Background: Performance Keynote Speaker. Jazz Saxophonist. Marketing Executive. Tech Entrepreneur. Hiring a keynote speaker is a major decision. The right speaker will not only entertain, inspire, and transform your audience, they will make your life easier as the event organizer. That’s why hiring Jeff Ponders II to deliver a compelling keynote on creativity, innovation, and performance may be the key to achieving the ROI and peace of mind you desire. CREDIBILITY | Jeff is a proven business leader and artist with 20+ years of real-world experience across multiple verticals. NO STRESS | Our first job is to make your job easier. Jeff is professional, easy going, and collaborative. You’ll never hear any ridiculous demands or requests. 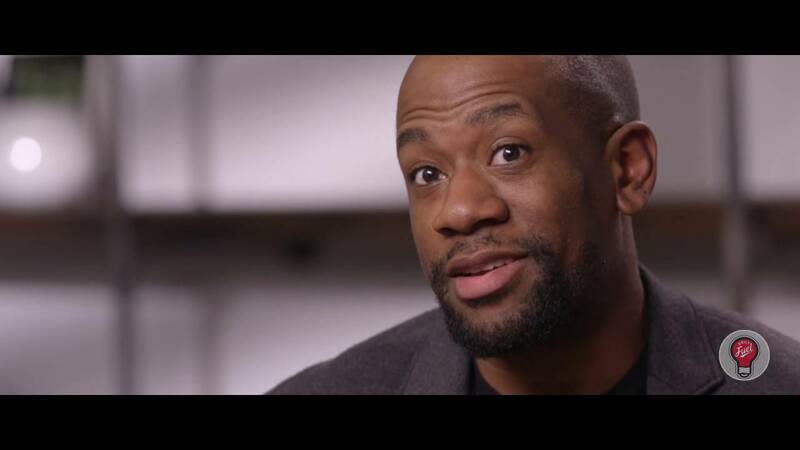 A UNIQUE PERSPECTIVE | An African American Ivy-league grad with experience as a corporate executive, tech entrepreneur, and professional jazz musician, Jeff is able to connect with diverse audiences and brings a fresh and provocative perspective. ENERGY | Jeff is a spark plug of infectious energy and enthusiasm with decades of performance experience. Your audience will be charged up and ready to perform with passion. EXCITING VISUALS & PERFORMANCES | Bullet points? Boring tables and long lists? Not here! Jeff's presentations are visually stunning with high-resolution images, professional videos, and even live performance from Jeff. CUSTOMIZATION | Jeff's keynotes are built around your unique needs. He takes time to understand your organization, audience, and objectives to build a custom presentation that’s sure to resonate with harmony. REAL-WORLD VALUE | Jeff offers practical takeaways that can immediately to drive business results. For Jeff Ponders II, embracing distinct passions and skills are the key to unleashing great performance. As such, he’s spent his career helping others unlock their best performances with creativity, innovation, and infectious energy. For nearly 15 years, Jeff has developed strategic initiatives and consumer experiences for some of the world’s most recognizable brands. As an executive with agencies like Leo Burnett and Digitas, he launched new capabilities and introduced game-changing strategies for clients such as General Motors, Walmart, Samsung, and Colgate. Today, Jeff helps ambitious brands understand their customers, find their place in the market, and develop business models and creative products as a founding partner of The Better Company. In addition to consulting large brands, Jeff is intimately engaged with the start-up community. He leverages his experience as a tech start-up founder to guide entrepreneurs and growth-stage businesses as an advisor and board member. Most recently, Jeff signed on as Entrepreneur-in-Residence at TechTown Detroit, one of the Midwest’s leading entrepreneurial incubators. Despite a demanding corporate schedule, Jeff remains true to his creative core. 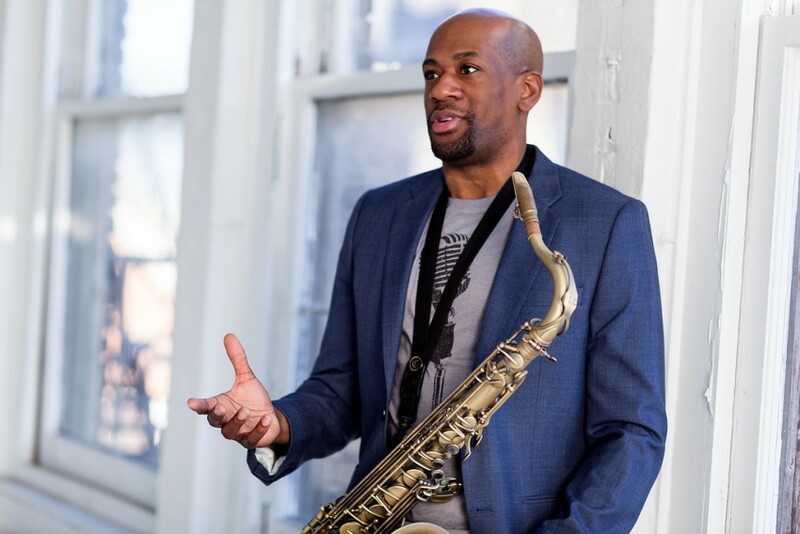 A professional saxophonist for 20+ years, he continues to perform and record with some of the most notable names in jazz, urban, and gospel music. His 2018 jazz album, Spark, is available on all major music platforms. Jeff frequently references his jazz training as the secret to his success in corporate and entrepreneurial endeavors. A vibrant keynote speaker, Jeff pulls from his unique experiences from the boardroom to the bandstand to help organizations achieve peak performance. 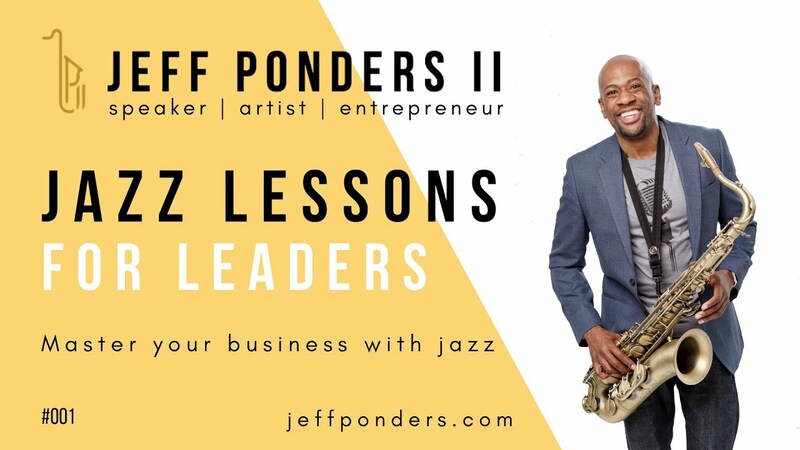 Using a mix of live performance, real-world stories, and practical techniques, Jeff helps audiences infuse jazz into their businesses to develop their talents, boldly tackle challenges, and collaborate to discover big ideas and achieve breakthrough results. Jeff graduated from the Wharton School at the University of Pennsylvania and proudly resides in his hometown Detroit with his wife and children. Computer, Projector, and Screen: Jeff uses a 13" MacBook Air with a Thunderbolt/Mini Display Port for video output. Jeff will bring his own HDMI adapter. Jeff's entire presentation is presented from his computer using a 16:9 aspect ratio. Jeff will provide a wireless clicker to use with his MacBook. The larger the screen and the higher the quality of the projector, the better. Microphone and Audio - Jeff prefers a wireless lavaliere or headset microphone. Speakers/audio should be high quality for the audience to hear audio/video clips played directly from Jeff's laptop. If Jeff is providing a live jazz performance during his keynote, please provide a wireless wind instrument microphone for Jeff's saxophone. Confidence Monitor: Jeff prefers a confidence monitor. A/V System Testing: Jeff prefers the ability to do an audio/visual test no fewer than 30 minutes before taking the stage. Internet Access: Not required. Jeff presents using his own laptop with embedded videos. The entire presentation is self-contained and does not require internet access. Jeff's musical performances range from solo saxophone performance to an 8-piece jazz ensemble. Please consult with Jeff and his team regarding technical needs based on the size of the venue and performance expectations. In today’s competitive business climate, professionals from all industries are forced to dig through the crates in search of insights to outshine the competition. Everyone wants to give winning performances, yet most don't invest the time to get better. Jazz masters understand that focused practice, collaborative rehearsal, and empathetic audience engagement are the keys to personal growth, collaborative creativity, and better performance. 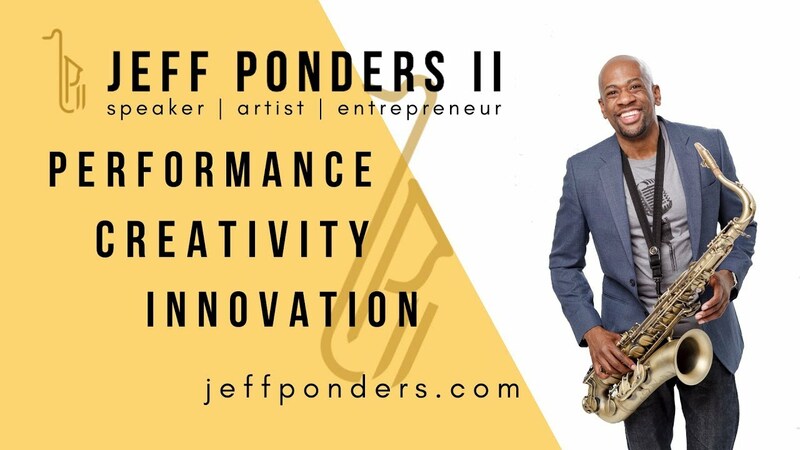 In this engaging keynote, Jeff will share lessons from his experiences as an entrepreneur, marketing executive, and professional jazz saxophonist to help your team develop their unique voice, enhance their skills, and outperform the competition. - The proven 3 stage process of jazz masters to deliver riveting performances. - How to leverage your personal passions for professional success. - How to improvise to overcome failure. -7 key secrets from jazz masters to unlock better performance. Jazz musicians never fail. Despite facing challenges every day like most professionals, they are trained to leverage the art of improvisation to turn seemingly inevitable calamity into breathtaking performances. Pulling from more than 20 years of experience as a professional jazz musician, Jeff will break down the secrets of jazz improv to help organizations break free from “how we’ve always done it.” Your leaders will be empowered to meet critical challenges with creativity, confidence, and style to create memorable moments and successful, sustainable performance. - Understand improvisation as a learned, disciplined skill. - Build the muscles and instincts to improvise. - How to listen to identify challenges and discover new pathways to success. - Techniques to get in rhythm and find harmony with your team and customers. - Identify what your bandleader persona. - Building the right band for the gig. - Transform teams from collaborators to co-creators to unlock audacious creativity. - Learn how to listen to grow, lead, and perform better. Planning and navigating a career in today’s economy isn’t for the faint of heart. Whether you're going in circles searching for direction, stuck in the org chart with no light at the end of the tunnel, or perpetually dreaming of launching your business, it’s easy to look up and wonder “where did the time go and how did I get so lost?” The truth is, there’s no shortage of opportunity... success is simply waiting for you to take control of your ship. Whether the goal is entrepreneurship, intrapreneurship, or just finding meaningful, fulfilling work at a company you believe in, the journey starts with owning your 'ship. In this workshop, we’ll walk through a proven process of self-discovery to clarify your vision and set sail to navigate your journey to success on your terms. • An attractive workbook to capture the experience and chart your course. Podium: Jeff prefers no podium to be on stage. If one is present, he prefers it to be pushed back so that he may walk the stage unencumbered. Beverage: Please have two (2) bottles of room temperature water available to Jeff while on stage.